Let us be your guides to a fishing trip of your dreams. This trip will not only offer excellent fishing, but the scenery will also be outstanding. This trip has something for everyone. If fishing is not your thing, we totally understand. We will take you on day rides to show you the surrounding area and educate you to the historical events of the area. This will include Native American history and also of the mountain men who trapped in here as well. The fishing will be on well known Young’s Creek and we will also visit the infamous South Fork of the Flathead, both are desired fishing destinations.On the day rides we will take you to visit the Historic Big Prairie Ranger Station, which is filled with history and historic buildings. This is an active ranger station in the Heart of the Bob Marshall Wilderness, a really interesting place to visit. fashioned” way, mantied (Spanish word meaning “to bundle”) on our mules joined together to create a mule string (train). This method of transporting cargo is truly a sight to see and becoming a lost art. We are very proud to continue this tradition. 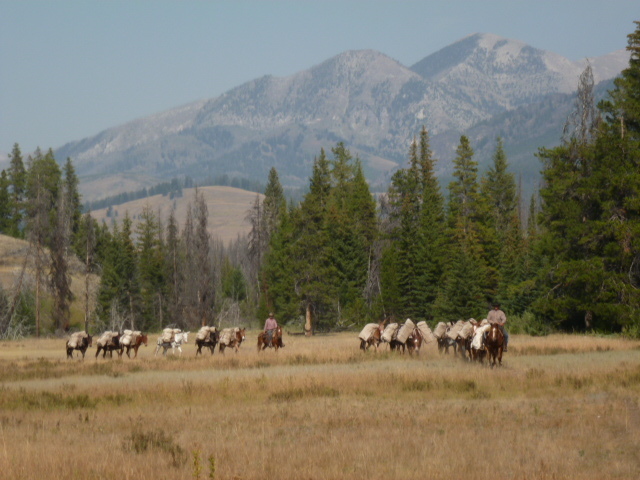 We truly hope this is a trip that tweaks your desire to live 8 days at a slower pace, ride 3 miles an hour (the average speed of a trail horse), listen to the clippity clop of their hooves on the trail, see the wonders of the wilderness, enjoy the solitude and relaxation a trip such as this offers, learn about the Native American history and of the Mountain Men who frequented this area long ago, become inspired by just being in a wilderness setting which is so special and unique. We look forward to hearing from you and adding your name onto our roster for this very special diverse wilderness pack trip vacation. A 1/3 deposit ($1040.00) will hold a place just for you on this awesome trip.